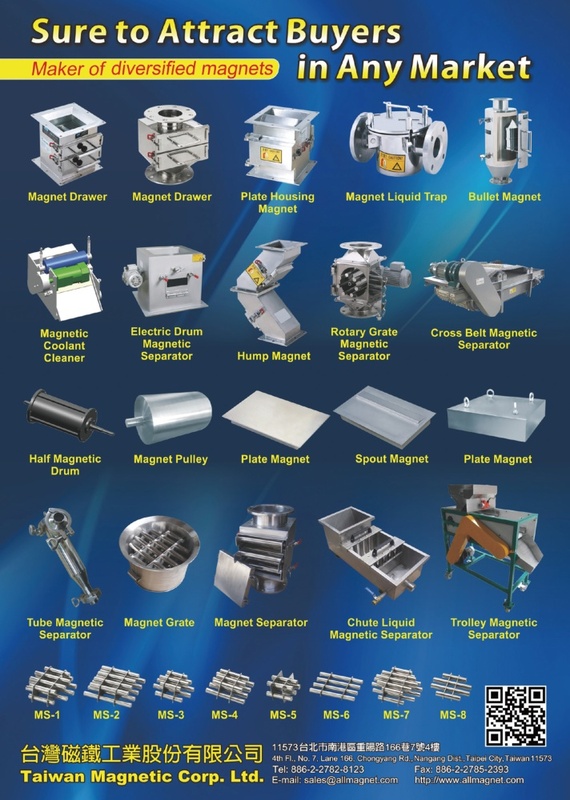 Taiwan magnetic Corp., Ltd. established in 1980, has been a leading manufacturer and exporter of specialized magnetic products for over 30 years. We are highly recognized by our customers both locally and worldwide for our quality products and prompt service. We have a technical collaboration platform, manufacturing and distributing innovative and fine magnetic and magnetic related products with a wide range of applications, such as, permanent magnets for electronic products, ironware, motors, stationery and various kinds of sensors. Magnetic separators for all kinds of production lines, like ceramic, electric, mining, plastic, chemical, rubber, food, pharmaceutical, environmental, dyeing, metallurgical and recycling…etc. We also customized our products to meet your specifications and requirements, and we guarantee you the best. Main Products: Permanent Magnet, Ferrite Magnets, Rubber Magnets, Plastic Magnet, Nd-Fe-B Magnets, Bonded Nd-Fe-B Magnet, Samarium Cobalt Magnets, Alnico Magnets, Rare Earth Magnet, Magnetic Separator, Magnetic Cleaner, Magnetic Sweeper, Magnetic Bar, Cross Belt Magnetic Separator, Magnetic Liquid Trap, Magnetic Grate, Magnetic Pulley, Plate Magnet, Magnetic Assembly, Pot Magnet, Permanent Magnetic Lifter, Magnetic Tool Holder, Magnetic Products.